Fig1. – My Budtrol stand completely set up. This large metal stand is of very rigid design and quality which will surely last forever even if improperly treated such as being left in the rain, and the rugged black finish makes it feel even sturdier – and look good. 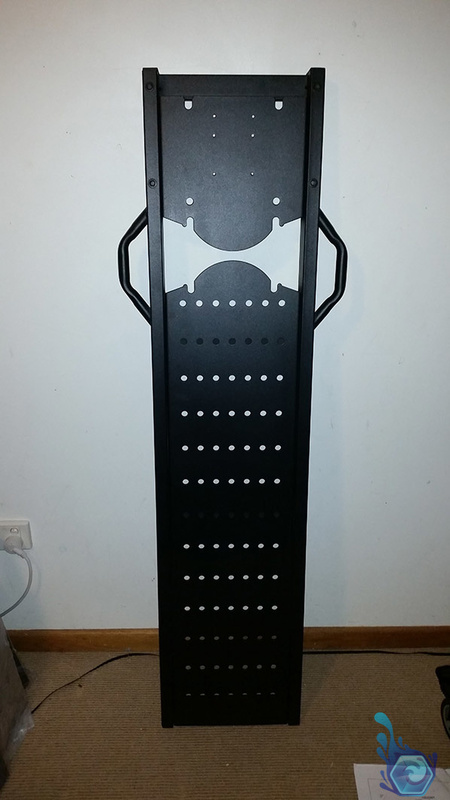 The stand is about 30 Kg’s in total assembled without a screen with only one mounted tray. 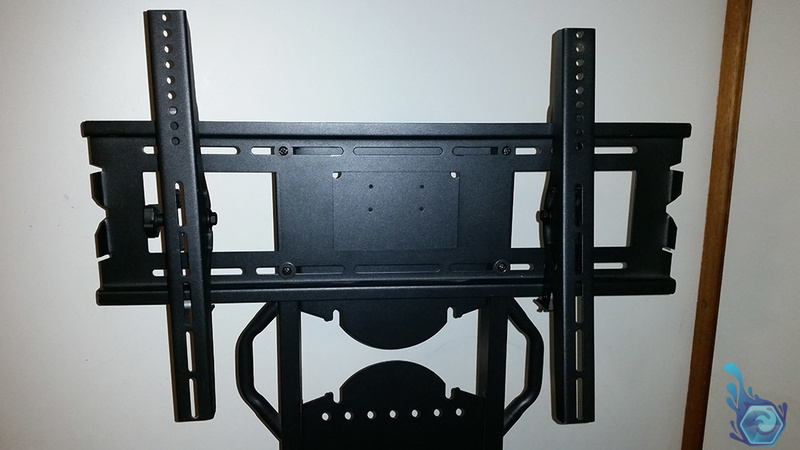 Overall it’s rated to hold up to 80 Kg Tv’s and a maximum size of 60″, although I believe you could mount slightly bigger ones if required and if their mounting system supports it. I purchased mine through Ebay at a pretty good price of $280 AU including shipping which I thought I should jump on due to the quality of the metal and the well designed nature of the product. Looking through the alternatives listed on Ebay I was a little sceptical about the quality of a few of them as they looked as if they would bend if I put a Tv on them! Another factor when looking for a Tv stand is the ability for additional and re-locatable shelves to put whatever I see fit on them. Budtrol also sold the shelves so that was a tick in the box for me, and at $40 AU it was another pretty good deal. Fig2. 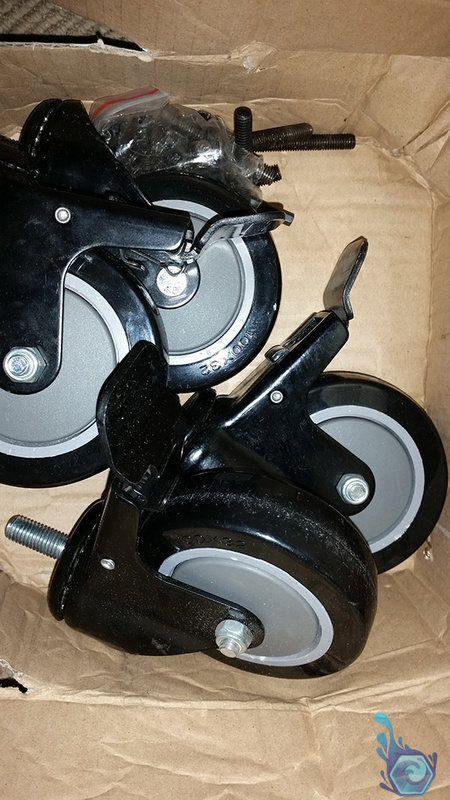 – Castor wheels in the box. Fig3. 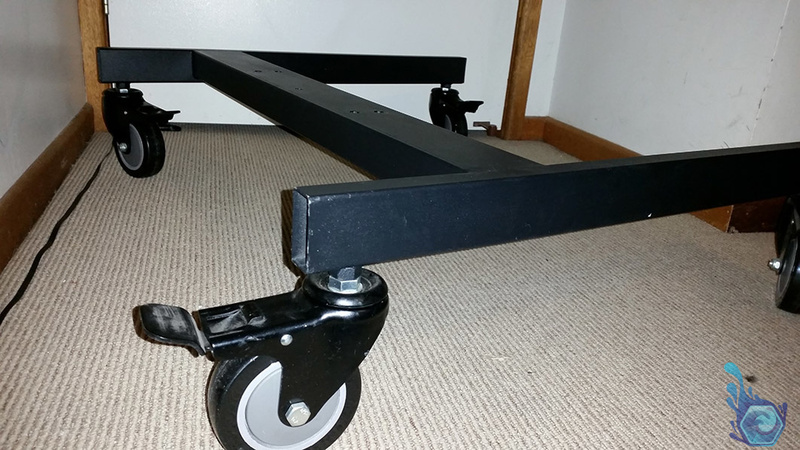 – The castor wheel base. This wall mount is made from 2.0 mm solid reinforced heavy-gauge cold steel. Fig4. 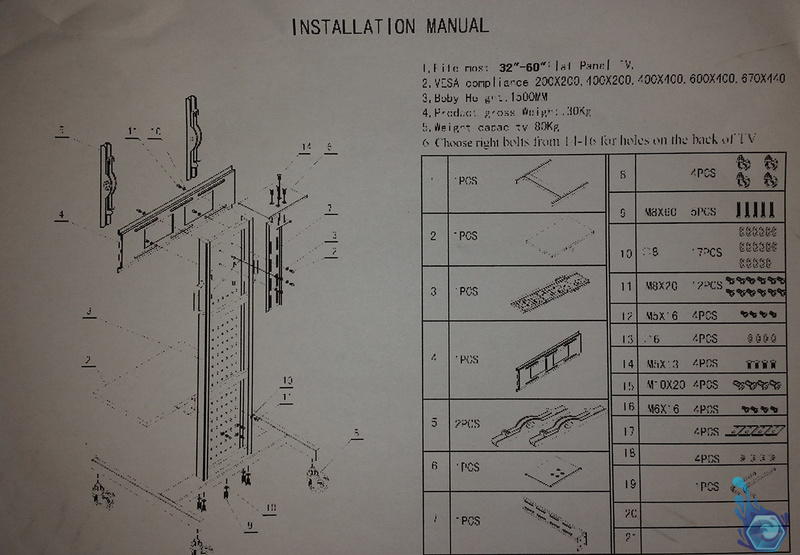 – The only instructions for the unit. Fig5. 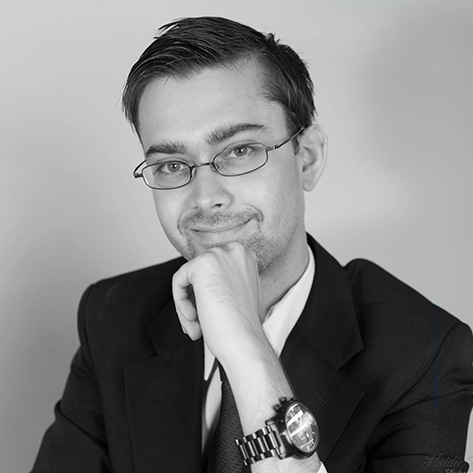 – One of the sliding arms hanging off the base. Fig6. – The tightening screw and the bolt to prevent the Tv coming off easily. 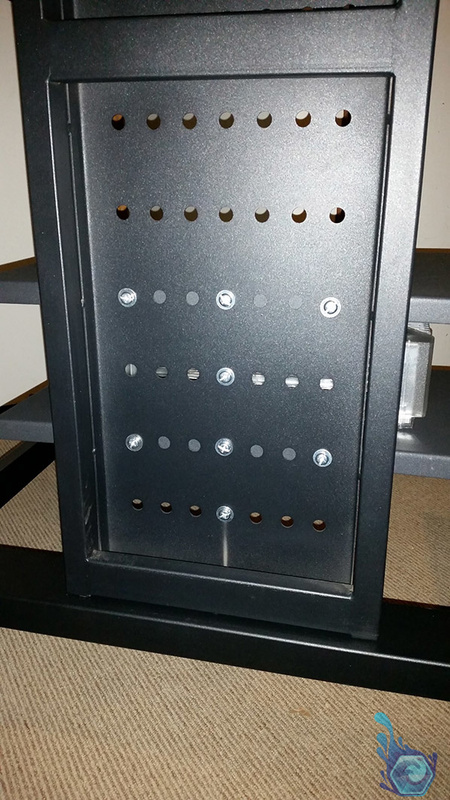 There are mounting holes for the shelves on the vertical section of the unit which can hold multiple shelves, although you will get less vertical space between each one the more you add, so measure your devices beforehand and leave room for dvd and game cartridge swapping. 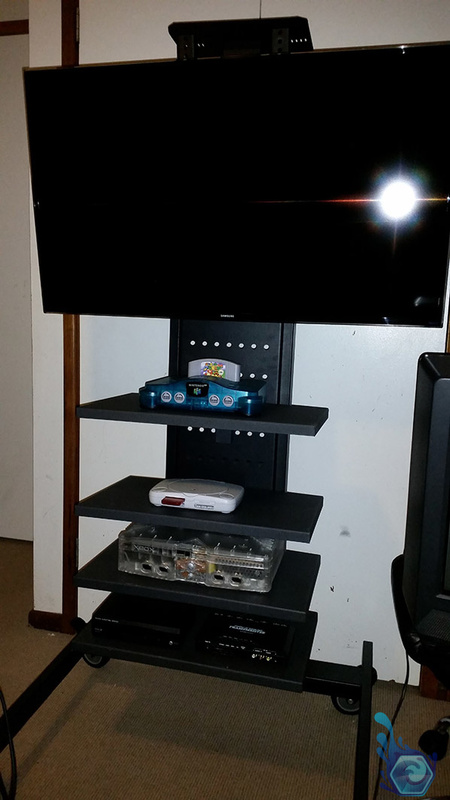 I found that four shelves was the perfect number for me, giving optimum space for the consoles without blocking a view of the tv for the larger items on top. Setting up the unit was a bit of a pain as the instructions basically consisted of one exploded diagram of the unit with the ambitious task of working out which pieces are what. Otherwise it was just as you expect to set up, requiring about 30 minutes to an hour and a screwdriver. The part of the unit that holds the Tv was a little confusing as I attached it to the unit first instead of the back of the Tv, as I should have done and which the instructions made no mention of. Honestly it’s much easier if you’re setting this up alone to just attach the bracket to the Tv and then simply lift it up and over onto the unit. 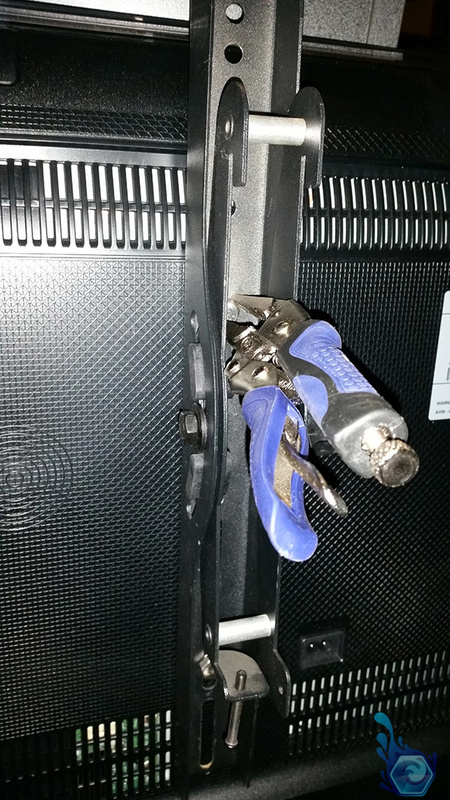 The alternative way is to hold the Tv steadily to the frame while attempting to screw the bolts into the back. Fig7. – The Tv connection point on the sliders. Fig8. – The 4 bolts on each tray. The bolts didn’t feel as if they were long enough to hold the Tv up through the thickness of the metal, although in the end they were perfect as you just have to ensure that they are tight. 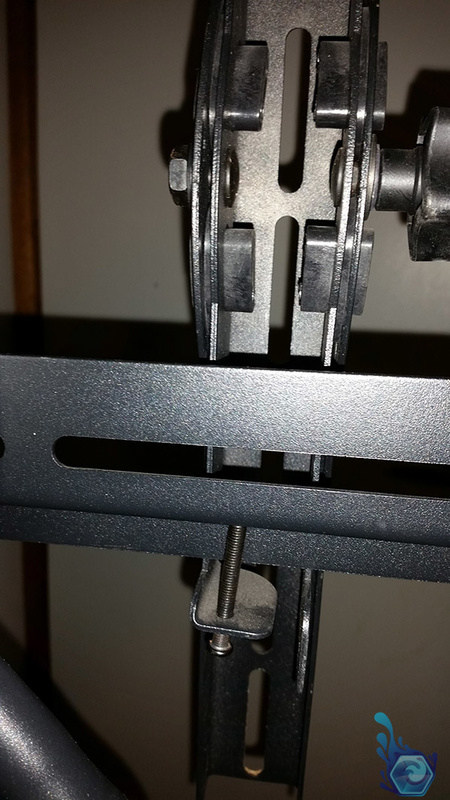 My main concern was that when screwing Tv’s and monitors into VESA mounts you could accidentally screw too much thread into them and permanently damage the screen or cause the glass to crack which would be catastrophic, or the alternative which is not screwing them in enough and having the screen fall to the ground and smashing. Either way there’s little room for error especially with the price of some Tv’s these days. Castor wheels are a must on these units as the whole point is being a re-locatable unit for displays and presentations or as a movable gaming station. I will hardly be moving mine during it’s life, although I mainly purchased it for the height at which the Tv is, so I can watch shows in bed streamed from my NAS while having it angled down slightly. Fig9. – Tightening the bolts on the back of the Tv. Fig10. – The sliding bar for Tv re-positioning. 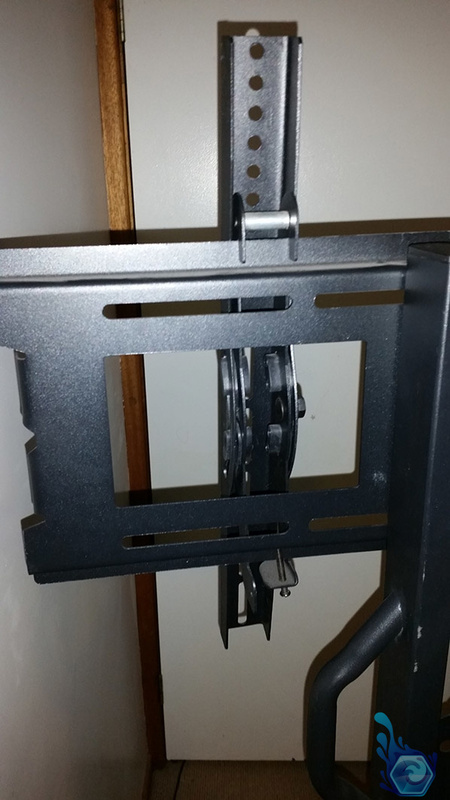 An annoyance I found with the unit is the large metal frame at the back which holds the Tv. This is a little too long for my liking and the biggest nuisance is the inability to reach the ports at the back of the Tv due to the coverage and proximity of this metal panel. I found a work-around by purchasing right-angle RCA plugs but I’m just letting you know it will be quite a struggle plugging anything in if you opt for the lowest Tv position on the frame. Speaking of position, it has a rather high amount of height adjust-ability, a range of about 40 cm’s letting you put it in the optimal position for your needs. The angle is straightforward to adjust although I would have liked a range larger then 30 degrees consisting of 15 up and down for the more peculiar usage patterns, such as watching shows in bed. Fig11. – The vertical section of the stand. Fig12. 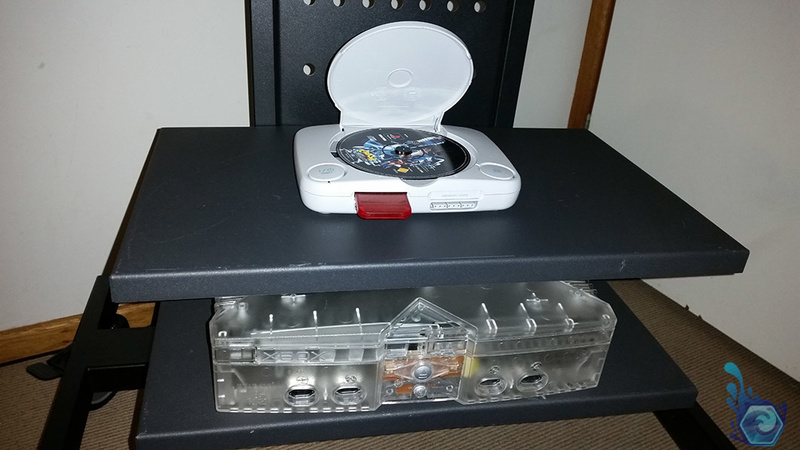 – The stand with consoles on the trays. There’s relatively little cable management options on the unit which is a shame, as I have a ton of cables from each device going to the back, and looping them around to the front again to avoid the appearance of cable clutter from the front. You can of course use some of the mounting holes for zip-ties which would clear them up a little more but then there’s always the problem of adding devices and having to re-zip every cable again if you’re a perfectionist. The shelves are just as strong as the main unit and screw on very tightly with four screws, if you’re wanting to place heavy objects onto them such as Pc’s or large speakers. It’s a pretty good deal for $280 AU with shipping and $40 per additional shelf. A well designed and sturdy unit with a nice black finish and rough texture. Quite a compact stand given it’s purpose and really reduces clutter, Fairly heavy but worth the trade-off for quality and sturdiness. Includes some nice features including a carrying handle, castor wheels, easy one-person monitor mounting, supports multiple trays. A nice looking unit overall with it’s black finish and fairly simple design which would look good in an office. Not the most innovative product but still useful nonetheless and fills a needed void of movable entertainment systems. Probably the only choice in a portable Tv entertainment unit with a very sturdy construction and a fair amount of customisability. The camera mount is a nice addition and overall it’s got a nice texture and aesthetic charm to it. Tagged Budtrol, Entertainment, Gaming, Stand, Tv. Bookmark the permalink.